The 1000 Kids, One Message! 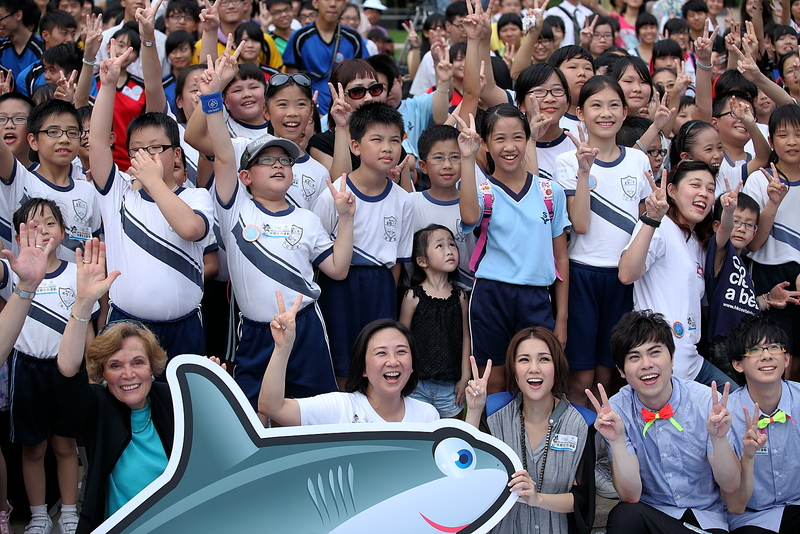 project brought together shark loving kids and a distinguished list of ocean heroes in Hong Kong to make a special pledge. It’s hoped that the children’s message from the hot zone of the shark fin trade will echo loud and clear through national and international media, as nation after nation bans the brutal and unsustainable practice of shark finning. The underlying premise of the project is clear – children are the future. The Ocean Geographic Society is calling on kids around the world to step up as the next generation of young ambassadors for sharks. Kids attending this event have been officially named Shark Ambassadors. Kids have the initiative and passion to save sharks from extinction and are the ocean’s best hope. That evening, Rolex in collaboration with Ocean Geographic Society (OceanNEnvironment), Cyberport and the Energy Saving and Environment Concern Alliance (ESECA), presented “An Unforgettable Evening,” celebrating the mystique of the underwater world through photos and films. With a focus on Antarctica, the tropical oceans, marine animals and climate change issues, featured appearances included oceanographer extraordinaire Dr. Sylvia Earle, founder of Energy Saving Concern Alliance Elizabeth Quat, and renowned photographers David Doubilet, Jennifer Hayes and Michael AW. Read more about the dynamic team of ocean luminaries who took part in this event here. Funds raised at these events will go to Ocean Geographic’s Shark Campaign.